Even this attempt was looking doubtful, with serious fog in the morning I was thankful I’d booked the 11am slot, but the race was on for the fog and low cloud to shift in time! At 10:20 the METAR was still pretty rubbish, cloud at 200ft and the clubs webcam was making me doubtful. Still experience has taught me that unless it’s a totally blatant no go, there’s often value in just being there – worst case you get a free coffee and a chat, best case the cloud clears or you get to steal a sneaky standby later in the day. All the signs looking out of the club window were that it was getting progressively (although slowly) better. Credit where it’s due, my instructor was planning for success and optimistic it would clear, the weather report would get updated and we could just go. So in the mean time, check the plane (G-HERC) out, she’d check my planning and then hang around and wait for the green light. It’s been weeks since I’ve run through the plane checkout so just flicking master switches on etc. was nice, especially as it wasn’t -2C for the first time in ages. A quite civilised checkout, rather then freezing to death and sweeping snow off the plane! Then it was just a matter of being optimistic and waiting….. I know how these dials all work, I do, honest…. Maybe this is a good sign, but recently my mistakes have largely been small and really noddy ones (but therefore ridiculous and the sort you want to bang your head on the yoke and scream “what am I doing!!”). This lesson would not break that curse. I knew I wanted to set 118 degrees on the heading bug, for god knows why reasons my brain mangled this in weirder ways then I look back and think are possible. First I think I set it as 180 (don’t ask), then I totally got the scale markings wrong and from a now vague memory I think I set 108 (don’t ask) before finally the cogs reengaged and I realised the scale was in degrees of 5 and we were good again. This was me on the ground, god help us!! I would continue my stupid errors my turning the altimeter QNH to 990 and then moving the dial so it was set to 1 mark ABOVE the 990 mark (you’d think 1 above 990 was 991 right? WRONG, I still want to check the sense in G-SHWK, but I fear they have different directional sense and I’d just gone with what heuristically felt more correct……..but in fact I’d just set 989). 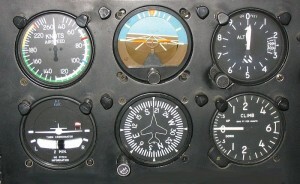 A top tip on human factors then, keep turning and verify the directional sense of the dials. I could omit these errors and save grace, but I can point you at plenty of accident reports from far more experienced pilots then me who’ve done equally stupid things. You might deny doing similar things, or find you’re also doing stuff like this, I’m certainly not the first to do them. Which way to Six Mile Bottom? Ahhh we weren’t over the noddy errors just yet, in my head I was so rehersed on a take-off from 05, that I instinctively said “Right hand turn”, even as we’d jumped in the plane I’d been fearing an 05 take-off because I’ve never found 6 mile bottom from that direction. As you can see on the photo of my map when this flight was first planned weeks back, it was from an 05 exit. We’re up, now to fly our way to the coast – but first, find the train tracks. I hate finding train tracks, particularly the ones that lead to 6 mile bottom. Firstly because I’ve rarely had to find them and second because they’re actually not as big as you’d expect them to be. Still we found them and with a bit of hmmm’ing and ahhhh’ing convinced myself the right road was crossing the right train tracks etc. Time to start the clock. As you can see from my flight plan, first waypoint was to find a road ~4.5 minutes away assuming the ground speed stuck with us at 109 knots. 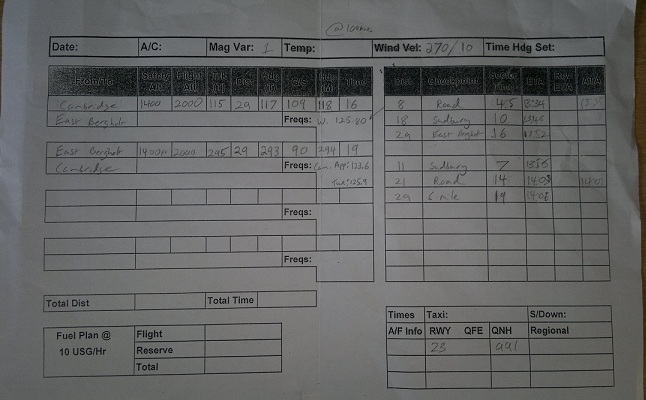 The flight plan also says we planned to fly at 2,000ft but due to cloud this wasn’t possible so the route was flown at 1,300ft – ATC asked us what our maximum was, I reported 1,500ft. As the cloud cleared we got permission to climb as navigation this low was not ideal. Worth pointing out that as of Six Mile Bottom, the instructor took over the flying part and I was ‘freed up’ to concentrate on the navigation and radio parts. 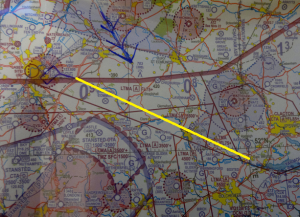 What this also meant was that, as you can see from my visual reminder arrow on the flight plan, when we found that road 8 nautical miles away, I’d have to tick a “first time” box. In this case: The first time I’d called another aerodrome. Sounds sort of rediculous right? Nearly 40 hours on the clock and to date I’ve spoken to my own aerodromes approach & tower frequencies, London Centre for a practice emergency and that’s it. Just to add to the mix, I’d be calling RAF Wattisham – a military aerodrome which has such fun things in its book of words as “Beware of lasers when Apache’s operating.” Plus I had no idea how different an RAF controller would be relative to the forgiving and well used to training pilots operators of my home aerodrome. “Squark 6541 G-HERC.” (Forgot I was going to be asked to do that so I broke my reply up). In six minutes, we should be over Sudbury, now the map shows Sudbury as having a river going roughly around it and you’d think that would be a good visual cue. 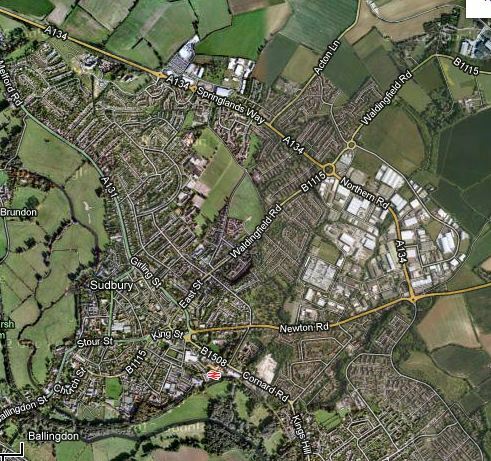 However, I’d done my homework, I knew the one distinctive feature of Sudbury is not it’s shape, but the fact it has a relatively huge industrial site on its east side. This shows up as you can see as a massive white/grey patch against a sea of buildings. From the air this is very easy to spot and so with four minutes to go I was pretty happy Sudbury was ahead of us and it was also telling me that we’d drifted off to the right. My instructors flying was looking pretty spot on, so I assume the wind wasn’t quite as forecast. Slightly to be expected given the planned wind was from a forecast now at least 2 hours old. From this point on it’s largely grass and fields, East Bergholt is flanked by Ipswich and Colchester so go to far left or right and you should find (unexpectedly) that you’re heading for a big town. However, from 2,000ft quite quickly you can see another very distinctive feature that suggests East Bergholt should be coming up: The Sea. I still find this weird, normally to get to the coast I’d have to drive for over an hour and a half. We’d been in the air at this point for a touch over 12 minutes!! To see the coast is just mind blowing, regardless of the fact that maths says this is obvious. It wasn’t the best day to be at the sea side, as we approached East Bergholt we flew into some rain and the weather was more murky in this part of the world then back home but we were about to turn round and head for home anyway. 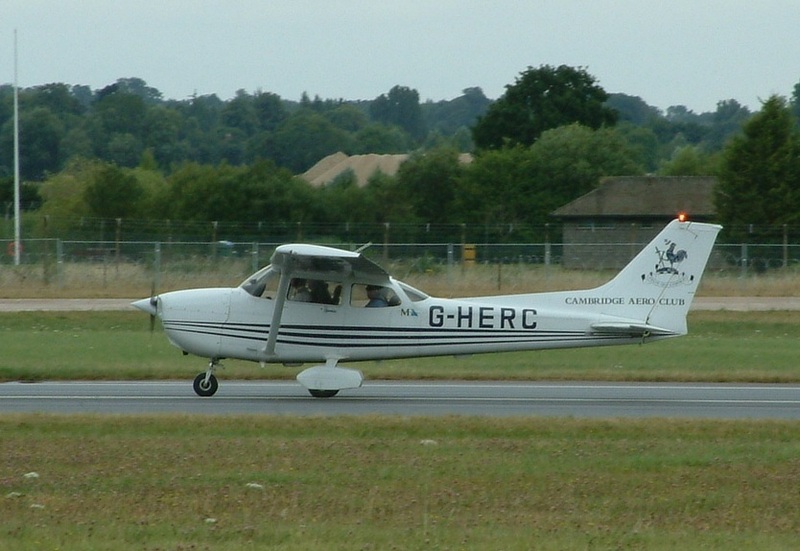 Having had the luxury of my instructor doing the flying so far, now I would have to do everything. It’s perhaps worth noting that actually flying the plane after a few hours practice is pretty easy, what you’re actually training to do is to fly the plane while managing the workload of flying, navigating, communicating on the radio etc. etc. Once you start trying to do these together, you’ll find your brain is working quite hard, the solution is practice to make more of it instinctive. The flight home was nice enough, the bit that was making me think harder was planning my ETA’s and adjusting as we hit a point sooner or later then expected. Generally speaking though I flew back holding 2,000ft and a heading of 294 well enough, I only really deviated when because I could see Sudbury again I knew I was left of course and so started a “progressive recovery of track”, meaning the heading no longer matched the bug for quite a while (which got spotted), quite rightly I was told to fly the course regardless and then correct when over Sudbury. This is just one of those instinctive things to do when you know to you’re off-course. I was trying to announce my plans as I went so my instructor knew what I was intending to do etc. I mis-read my plan and announced I was going to get over Sudbury and then call RAF Wattisham to request a transfer to Cambridge approach. My instructor just acknowledge this, a few minutes later while glancing back at my plan (remember that visual cue arrow, pointing from Road->Wattisham), I realised I wouldn’t be out of the MATZ until the road, so instead of calling them at Sudbury I should call them at the Road waypoint. To which my instructor said it was good to see I’d spotted the mistake and corrected my intentions. RAF Wattisham saved me from having to call them up and let us know we were good to now call Cambridge Approach. The wind farm that was getting ever bigger out of the window suggested we were still on course, time to call Cambridge Approach (the bit that always seems to go wrong). Initially it went ok, we got a basic service and were told to report when 5 miles out, no problems. However at 5 miles out it was time to request a rejoin and my radio call just went to hell after transferring to Tower, a mumble of rambling roughly related statements followed – even my instructor couldn’t hold back an outburst of laughter. Every time I call them up they seem to give me a totally different set of things to read back or a sea of traffic. Still we got there in the end and were cleared to join downwind for runway 05. The circuit was good, but the final approach I just lost too much height and on runway 05 there are two large pools of water which make you sink quite a lot in the last few hundred feet. I’ve got used to expecting this extra sink and thus coming in high, but today I didn’t and just let it come down too much. Time to go around and try that again. The go-around was a decent circuit, though now my instructor spotted I’d done it again: I’d set the airfield QFE which should have now been 989, to 991 (inverting the mistake I’d made on taxi), hmmm. I had a better turn onto final and came in higher over the water this time. Just didn’t quite get it as settled as I’d have liked so the landing was a bit hard but I’ve had soooo much worse, it wasn’t bad enough to ruin the flight, wasn’t my best, but was far, far from my worst. This entry was posted on Tuesday, March 19th, 2013 at 9:31 am by PHC	and is filed under Actual Lessons, PPL Course. You can follow any responses to this entry through the RSS 2.0 feed. You can leave a response, or trackback from your own site.